Food processors are the fastest growing small kitchen appliance. They are very versatile machines that can chop, slice, dice, shred, and puree many different foods, helping to reduce prep time in the kitchen. Some of the more expensive models can also knead bread dough and mix ingredients for baking. When considering the purchase of a food processor there are numerous factors you may want to consider. The capacity of the food processor may be one of the most important ones since it has to do with the way you intend to use the appliance. Capacities normally range from about 7 to 16 cups of dry ingredients. If you have a large family or regularly cook for a crowd, you may want to purchase the larger 11 to 16 cup models. However, these are typically more costly, heavier, and take up more counter space than the smaller units. A 7 to 9 cup model will be an adequate size for most cooks. Many of the more recent models of food processors have a wider feed tube than earlier models. This can save you time since you don't have to cut up fruits and vegetables to a relatively small size. Some food processors come with a larger variety of accessories. Shredding and slicing discs are standard on most processors. Some come with additional blades as well as a dough blade. A few even come with a juicer attachment. We will recommend two different food processors in this article. The first is moderately priced and will meet the needs of the majority of home cooks. The second is an expensive unit that will meet the needs of the individual that needs "the very best". We believe the Cuisinart Prep 11 Plus (pictured above) is the ideal model for the majority of home cooks. This is an 11-cup food processor with a brushed stainless steel finish that fits in nicely with most of today's kitchens. It has a revolutionary motor with alternate speeds for perfect mixing, and features Cuisinart's patent-pending Dough Control technology, which adjusts the speed to automatically ensure proper dough consistency. It has a Lexan bowl which is nearly shatterproof and is dishwasher safe. The one-piece Supreme wide mouth feed tube allows you to hold whole fruits and vegetables such as tomatoes, onions, and potatoes. It comes with: a stainless steel medium slicing disc (4 mm), a stainless steel shredding disc, a chopping/mixing blade,a metal dough blade, small and large pushers, a spatula, a how-to DVD and an instruction/recipe book. It has an 10 year warranty on the motor along with a 3-year warranty on the entire unit. The Prep 11 has an outstanding rating on Amazon from nearly 500 users. 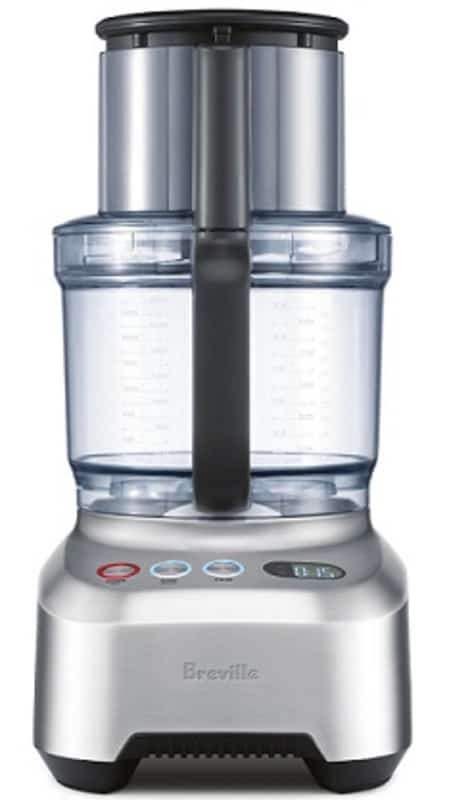 It's rated as the best food processor on both Consumer Search and Consumer Reports. Users rave about its durability so we believe it will give you years of excellent service. 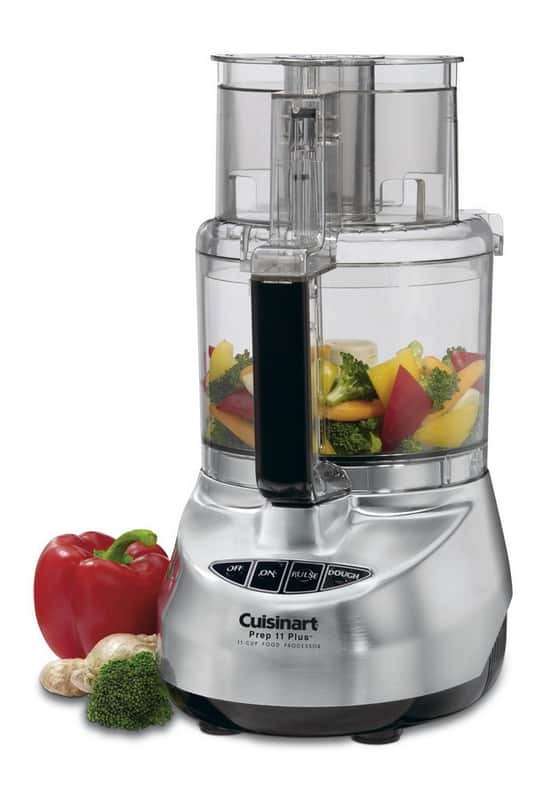 If $180 price tag for the Prep 11 is a little too rich for your blood, we suggest you consider its younger brother the Cuisinart Prep 9 which has a very similar set of features to the Prep 11 but in a smaller size. The Breville BFP800XL Sous Chef Food Processor is the top of the line food processor we recommend. This unit comes with two BPA-free processing bowls. One large 16 cup work bowl as well as a 2.5 cup mini bowl. It has a heavy duty design with a reliable 1200 W induction motor that boasts an industry-leading 25-year warranty. This is one of the most powerful food processors in the market. It includes five multifunction discs including: an adjustable slicing disc, a julienne disc, a French fry cutting disc, a reversible shredding disc, and a whisking disc. The variable slicing disc has 24 settings so you can change the thickness of your slices from 0.3 mm, for paper thin potato chips, all the way up to a thick 8.0 mm, for a nice thick tomato slice for your hamburger. All the slicing discs are made of top-quality stainless steel. The Breville Sous Chef also comes with three blades including: a micro-serrated S blade, a mini blade, for use with the mini bowl, and a dough blade. All the included accessories can be kept in a custom storage container which comes with the unit. Even this storage container has a unique design since it can be stored either flat or on it's side depending on where you want to store it. The 5-1/2 inch wide chute allows you to prepare even full sized potatoes easily. The unit also has an LCD display with a count-up and count-down timer. This can be used to set the desired time required for processing, stopping the process once the time is reached in countdown mode. The Breville BFP800XL is rated a remarkable 4.7 by users on Amazon. Other online review sites also rave about this food processor. 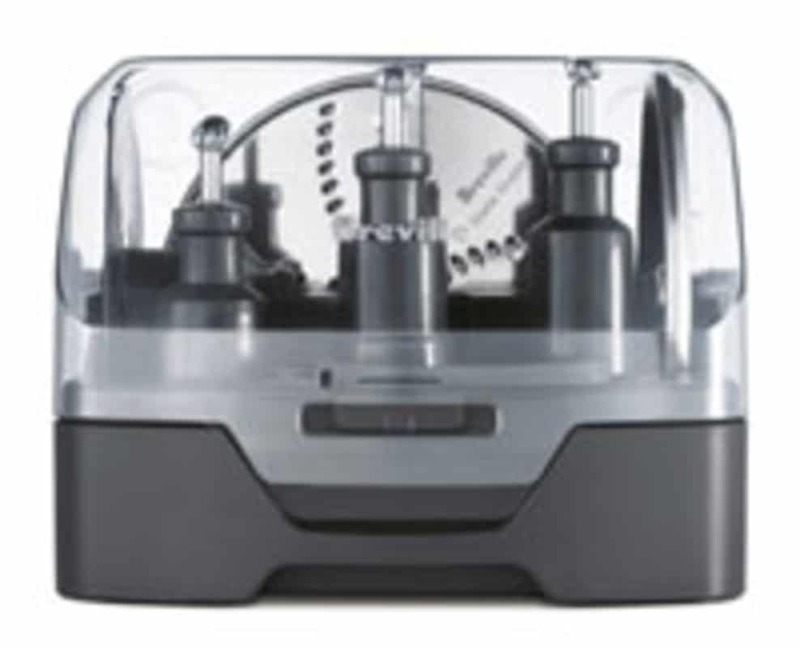 After testing the Breville unit in January of 2012, Consumer Reports named it as the top-rated food processor, replacing the Cuisinart Prep 11 as mentioned above. The unit is quite pricey at $400, but if you're the kind of cook that prepares large quantities of fresh fruits and vegetables, it might be the best investment you can make for your kitchen.